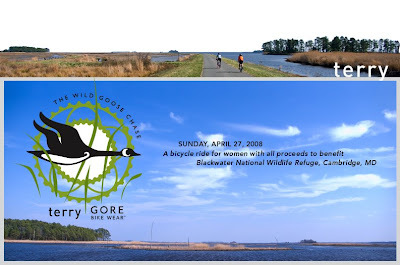 Ride a bike: Wild Goose Chase Ride! Blackwater Refuge was originally established in 1933 as a haven for ducks and geese migrating along the Atlantic Flyway. The Refuge is a popular place during the November migration when upwards of 35,000 geese and 15,000 ducks visit Blackwater. Blackwater is also a haven for several troubled species including the American bald eagle, the endangered Delmarva fox squirrel, and the migrant peregrine falcon. The Refuge is host to the largest breeding population of bald eagles on the East Coast, north of Florida. We'll be doing a 65-mile route around this beautiful refuge- you can even watch the osprey cam, the have an egg alert. Riveting, I know. I'll try to post from Maryland with some pictures and updates. I'm excited to use my new Grrmin too. Stay tuned.